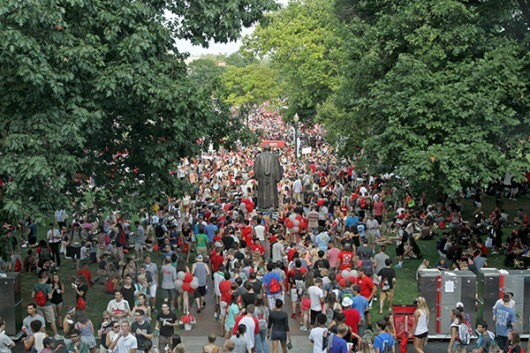 Hello fellow Buckeyes, and welcome to the beginning of a new semester at Ohio State! It’s that time of year again. The hot days of summer will eventually cool to fall’s leaf-rustling chill and the brick walkways that snake throughout campus are once again populated by bustling bodies hurrying to science labs and residence halls. Ready or not, school has begun. New years are filled with new beginnings and goals, and The Lantern is not exempt from these annual changes. This issue marks the first print publication produced by the new staff of The Lantern, and we are very excited to share this special “Welcome Back” issue with all of you. We are The Lantern’s editors, and we are also OSU students. We represent a range of majors, disciplines and interests, and work each day to keep you informed with what is going on on our campus and in our city. From comprehensive coverage of OSU’s sports teams to local concert reviews to profiles of OSU’s astounding variety of organizations, The Lantern strives to be the student voice of this university. It is with this responsibility in mind that we determine the stories to share with you each day. But we cannot do this without you. We encourage you to read us, of course, but we also want to hear from you. You can join the conversation by following @TheLantern, our publication’s main Twitter account. You can look forward to a new issue of The Lantern every Tuesday, Wednesday and Thursday. The papers are distributed throughout campus and are available for free in many academic buildings and residence halls. Additionally, you can download our new app, available for both Apple in the iTunes App Store and Android on Google Play. You can also view exclusive web content like videos, photo galleries and extended stories on our website, thelantern.com. So whether you are an avid reader of The Lantern or if this is your first time ever picking up our publication; a senior eagerly awaiting your graduation this year or a freshman who is entirely new to OSU; or anything in between, know that this publication is for you. This year, like all others, will bring with it changes, both good and bad, but you can rely on The Lantern to be here every step of the way. Shoot! I clicked on this article hoping to say something snarky but dang if you didn’t go and make me get all nostalgic about the place. I had lunch with a fellow vet recently and we discussed our children. As I sat and watched my J School grad fuss and become very nervous completing a CNN prerecorded interview (wow I’m out of touch with new HR recruiting haha) I knew sending my child to OSU was the right decision. I have said “You will be rewarded for not quitting on your team for internships like others and helping them to the first title in buckeye program history! !” Not many can say their first interviews out of J school were ESPN and CNN!!!! !